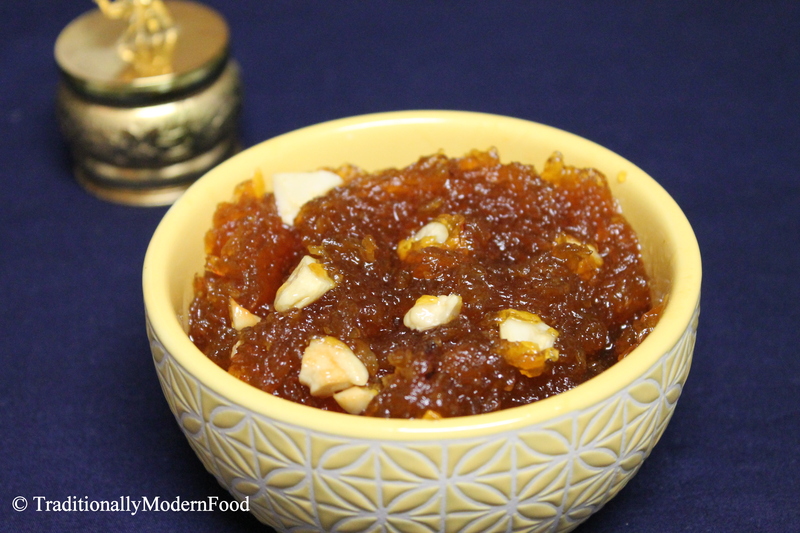 Its guest post day, and today we have Anupama from Easy bites Online. Social media is playing a great role in finding new people, I happened to see Anupama’s post in a FB group and started visiting her space. I am a big fan of her healthy recipes. I apporached her to do a guest post for Toddler friendly recipes, she instantly agreed and here is her healthy snacks. Quinoa, although less known, this super grain is making a definite way into our lives, rightly so if you ask me. 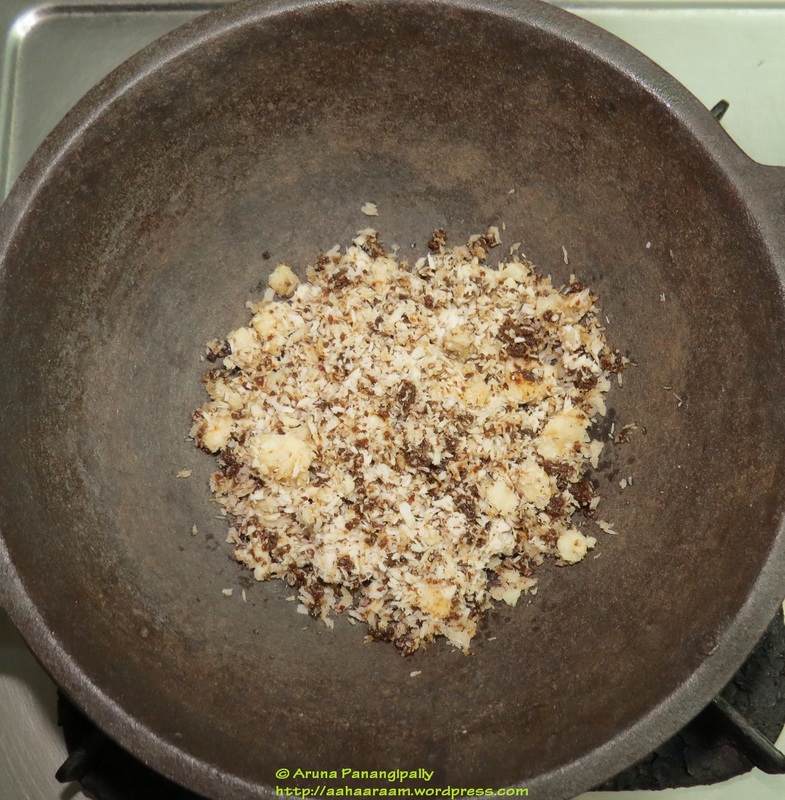 Packed with all the eight essential amino acids (and thereby a complete protein), fiber, magnesium, phosphorous and iron, quinoa has made its way for sure into my kitchen. Nearly every meal of ours entails either rice or wheat, our habitual grains. I am aware that to bring in quinoa can be tricky especially with picky toddlers! When Vidya Srinivasan, from Traditionally Modern Food, asked me for a toddler-friendly guest post on her blog, I could not refuse; not because I find it hard to say ‘No’ to anyone, but because being such a professional, enthusiastic blogger, lovely and a thoughtful person that she is, I simply could not bring myself to say no. I feel this has opened up another channel to know Vidya and her wonderful blog better. 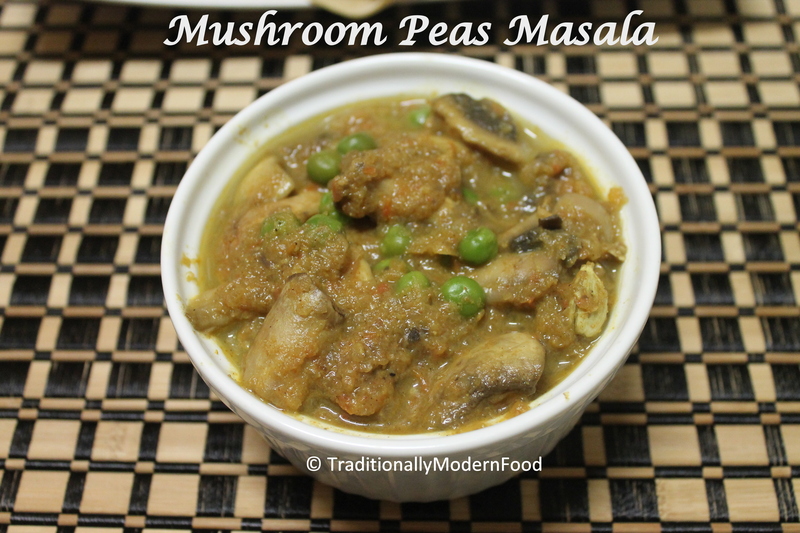 Do visit her blog for numerous delicious, healthy recipes. I decided this would be another opportunity to bring in quinoa and make it toddler-friendly! An eye-catching finger food presented to hungry kids after school is sure to entice them to dig in. 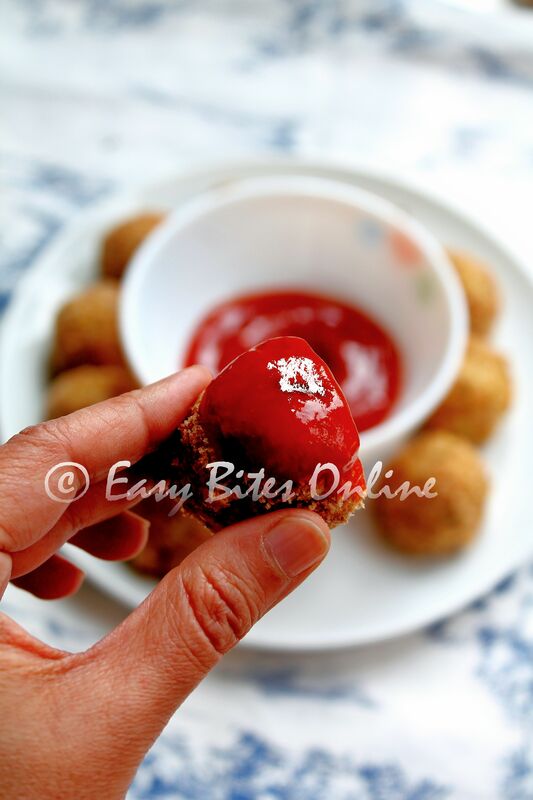 As anticipated, the array of Baked Quinoa Croquettes sitting at the table with some ketchup, drew my kids to it. They simply grabbed one each, dug into the dip and ‘puff’ it was gone. 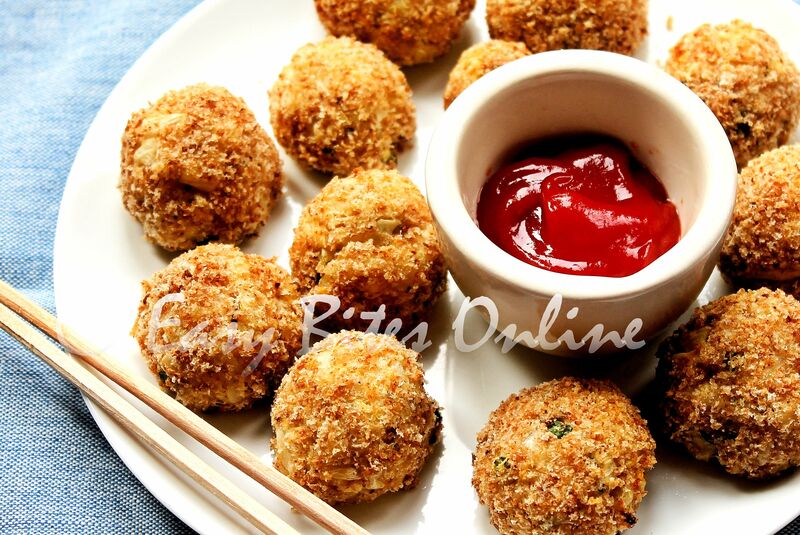 These are baked, however, can be deep-fried too. – First cook quinoa as per the instructions on the pack. – Add this 1/2 cup of cooked quinoa to a bowl, add the rest of the ingredients. – Mix everything well. it should come together nicely like a dough. 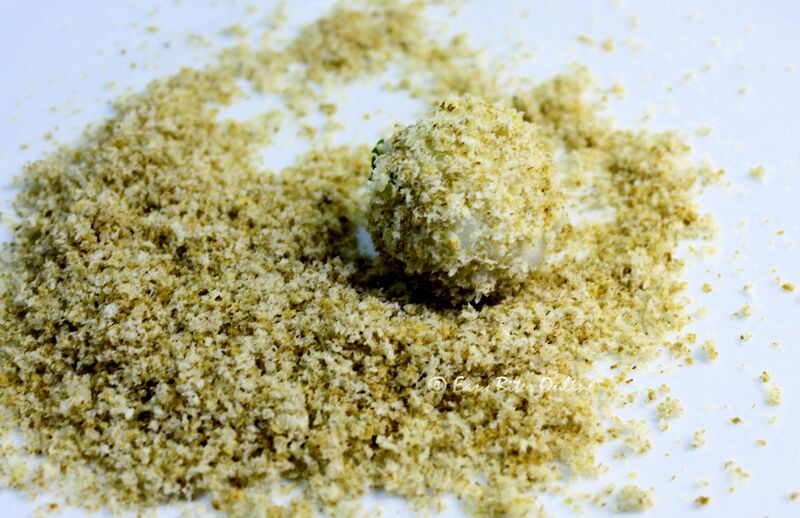 – Now take small portions of the mixture of the size of a golf ball. – Flatten it over your palm using your fingers. 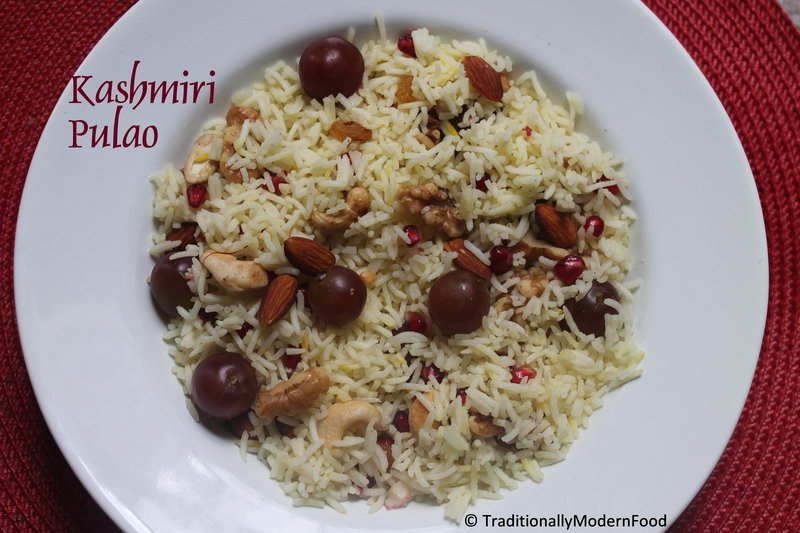 – Place a couple of raisins and cashew pieces (if preferred). cover this up by bringing together the mixture all around and over the stuffing. 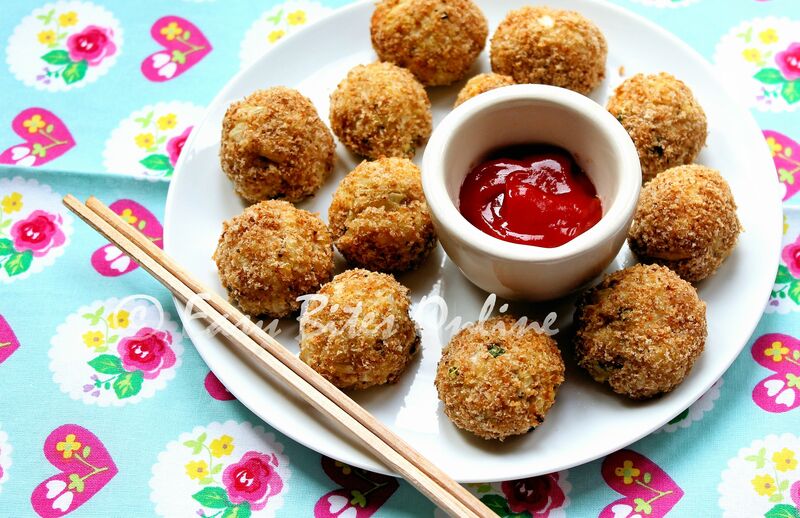 make a ball shaped croquette. 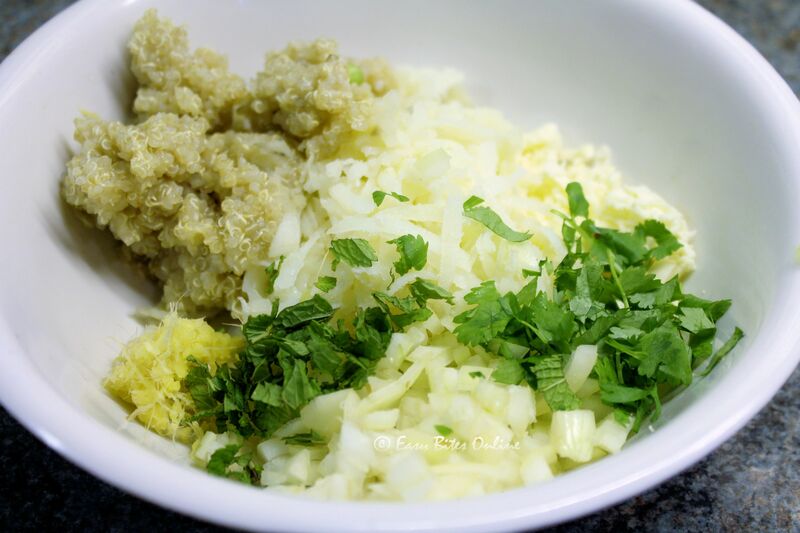 – Now, dip this in cornflour slurry, then roll over bread crumbs to cover all over. Pat gently all over to allow bread crumbs to stick well. – Place this on a plate or tray. Repeat the same with the rest of the mixture. – Pre-heat the oven to 190 deg C.
– Allow these balls to sit for 10-15 min. this will allow the corn flour to harden a bit. This will ensure that the balls do not open up when deep-fried. It retains its shape well too when baked. 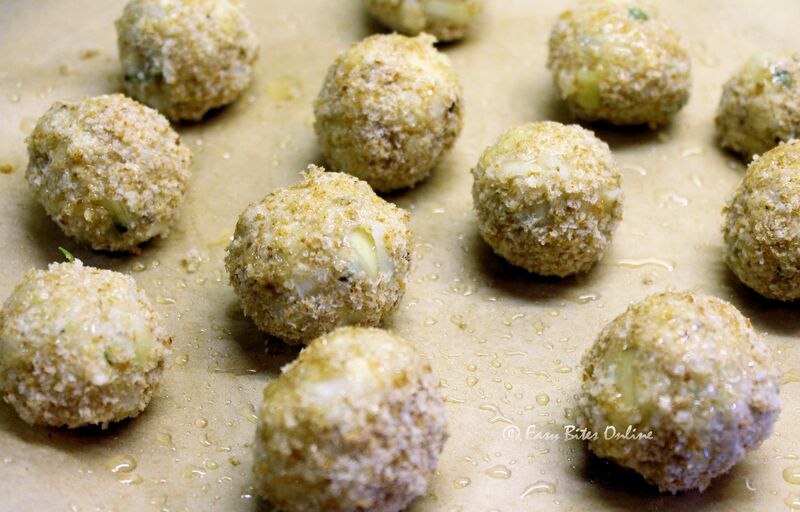 -Now drizzle over or brush gently some olive oil over each of the balls. -Place them on a lined, greased baking tray. -Bake them for 22-25 min or until nicely browned up. Since this is meant for kids, green chili has not been used. but if tolerated, can be used. 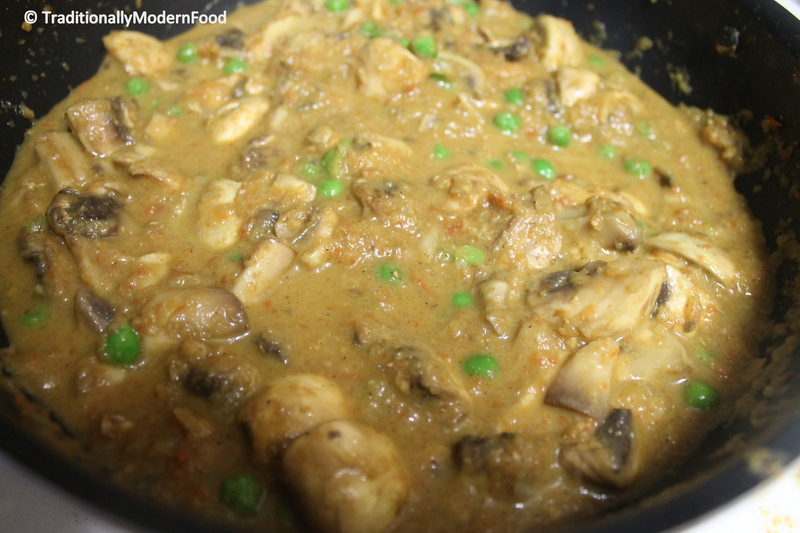 If preferred, the cornflour slurry can also be seasoned with salt and pepper powder. 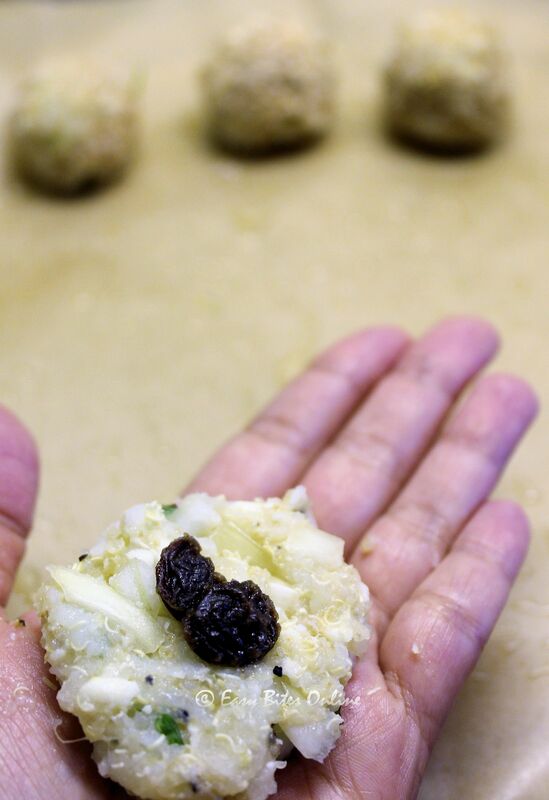 The finer you chop the vegetables, the easier it will be to prepare balls. Stuffing with raisins, nuts is optional. 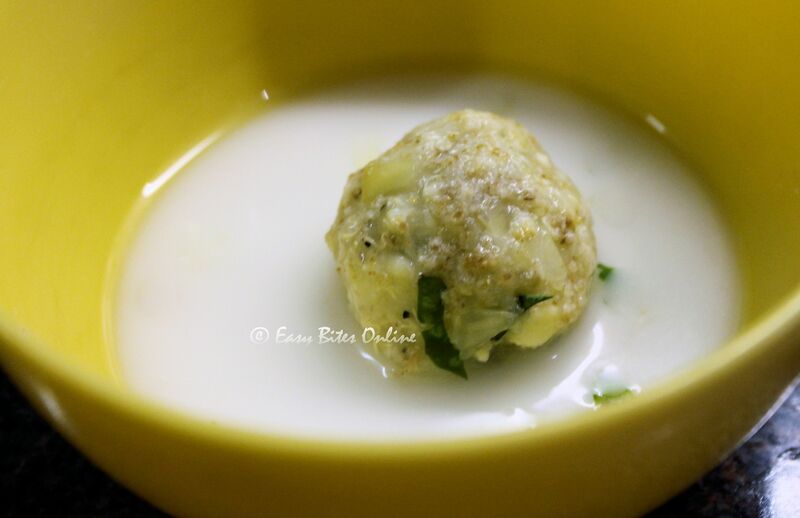 if stuffing is not preferred, make smaller balls. Keep an eye on the bake. Allow it to cool slightly before you attempt to remove from the tray. Use a flat plastic ladle to gently dislodge it from the tray. 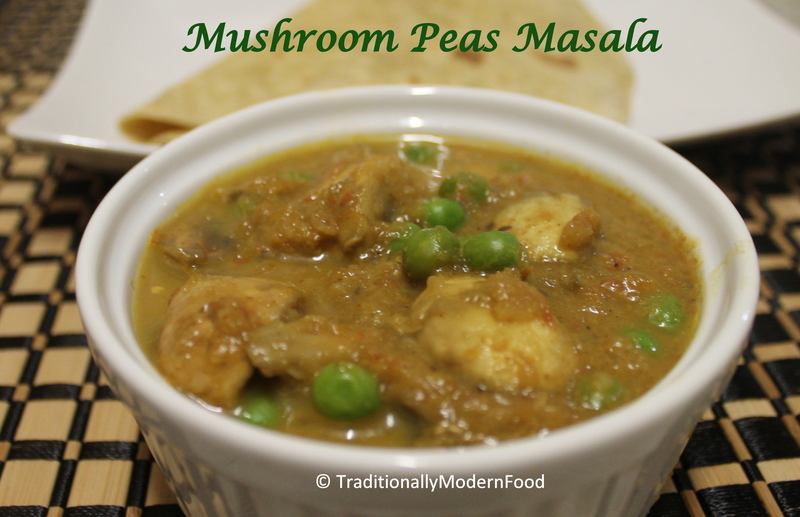 Today we have a toddler friendly recipe from Sandhya – Sandhya’s kitchen. I got connected with Sandhya through Social media. Sandhya is sweet person, and being a mom she shares lots of tips. After starting toddler friendly recipes, I thought of asking few moms I met in this blogging world and Sandhya was one among them. I am a big fan of her food photography and her yummy dishes. 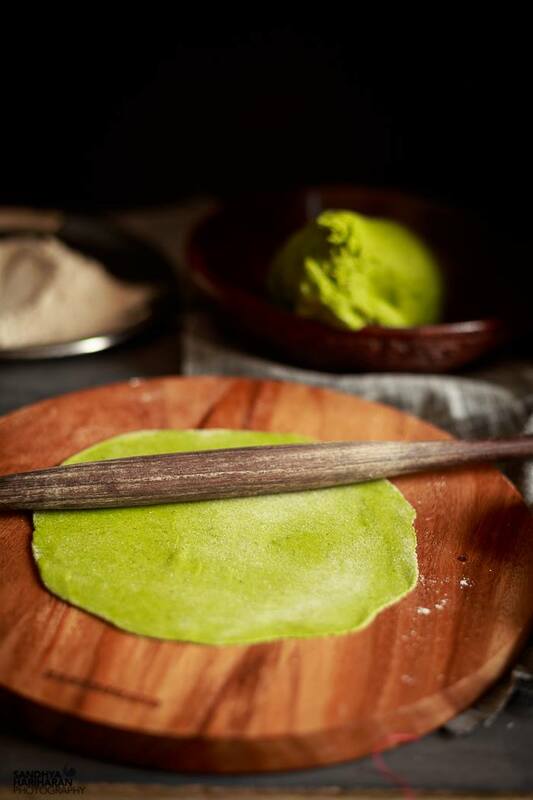 Sandhya gave me few options, and Spinach roti was my favorite! Over to sandhya. A fortnight ago, like every morning, after sending my elder one to school, I was sipping my morning tea. I was having some time for myself checking my emails, facebook , news and so forth. I read a message from Vidya about doing a guest post in her space , specially for toddlers. She such a lovely and warm person , I have known e-socially over the last couple of months .How can I refuse ? I had no second thought as I knew I was going to do that. Thank you for giving me all the time in the world and let do this interesting delight at my pace. We are a family who love to have a mixed variety in a meal all through the week. I am sure, in this modern world most people would. Our diet varies from Palakad South Indian cooking to a North Indian Paratha, Curry to a Pasta Bake and what not? Guess this post will have a never ending page, if I have to list the elaborate choices we have. I have grown up eating my mum’s super soft flame baked phulka’s literally every day, either for my school lunch or a meal at home. This has been one of my comfort meal any day. Undoubtedly we love our regular flame baked phulka’s with any dry vegetable curry or may b dal or paneer delicacies or if pulse arenas. We love spinach and its richess in iron is definitely something that makes us include in our diet ritually. When it comes to kids, getting my son V eat his spinach in gravy or a molagutal ( southindian lentil coconut curry) is slightly tricky. Knowing his love for Parathas , I decided to use them in the dough. It was a complete win win situation, as all the required spinach is being consumed and yet there no complain from the boy of 7 years. All that he tells me is that the Green Chapathi is Yumm. 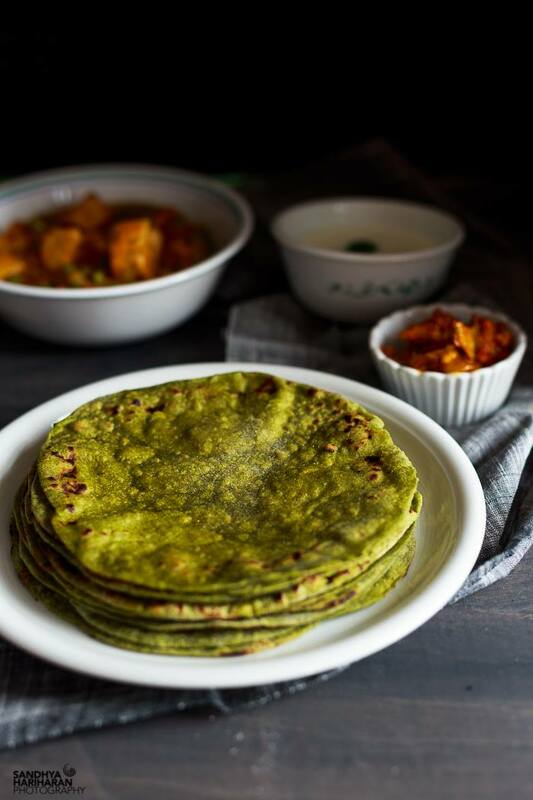 This is an easy way of sneaking the greens into our diet using the whole wheat spinach phulka’s. Sunflower Oil or Oil of your choice 1 Tbsp. 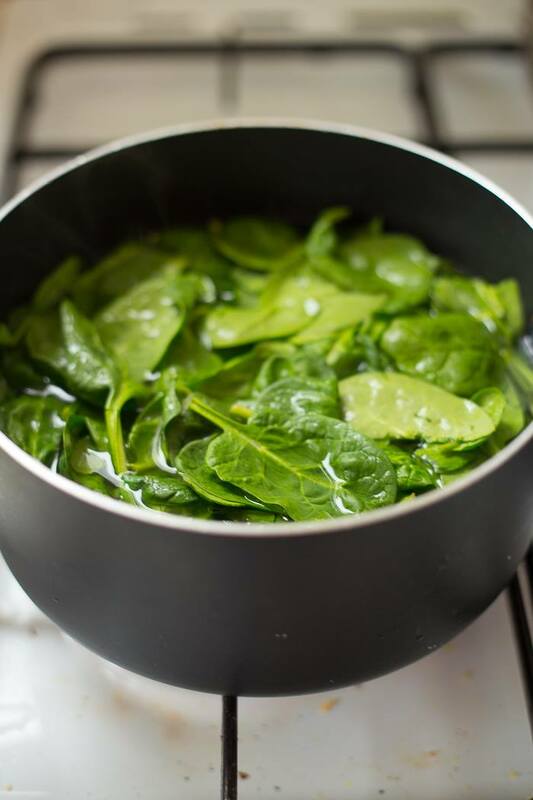 In a large pot, heat some water and add the spinach leaves along with some salt. Allow them to blanch for 5-6 minutes. 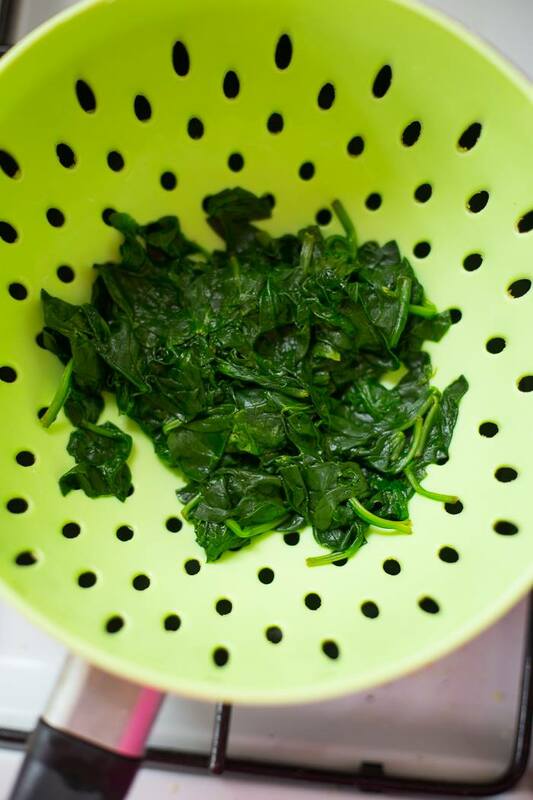 Drain the hot water from the spinach leaves and run them under cold tap water. 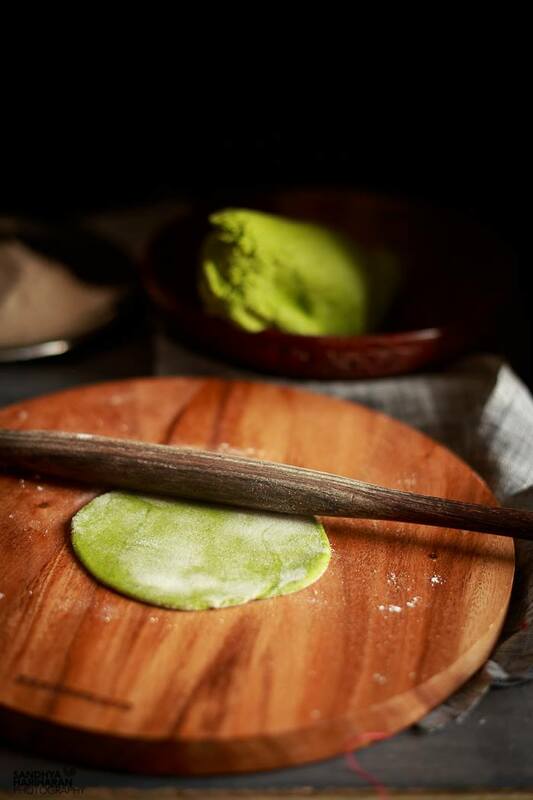 Grind the spinach leaves along with ginger and make a fine puree. 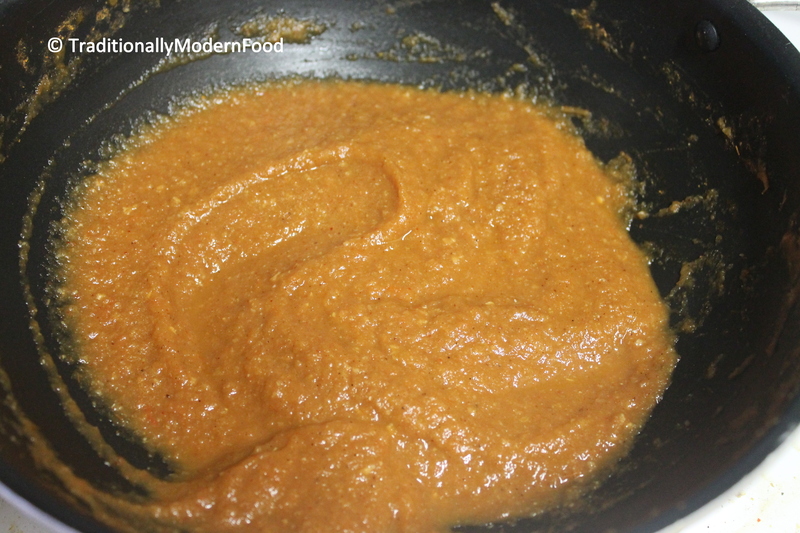 This puree approximately came up to ¾ Cup. Add very little water if required. 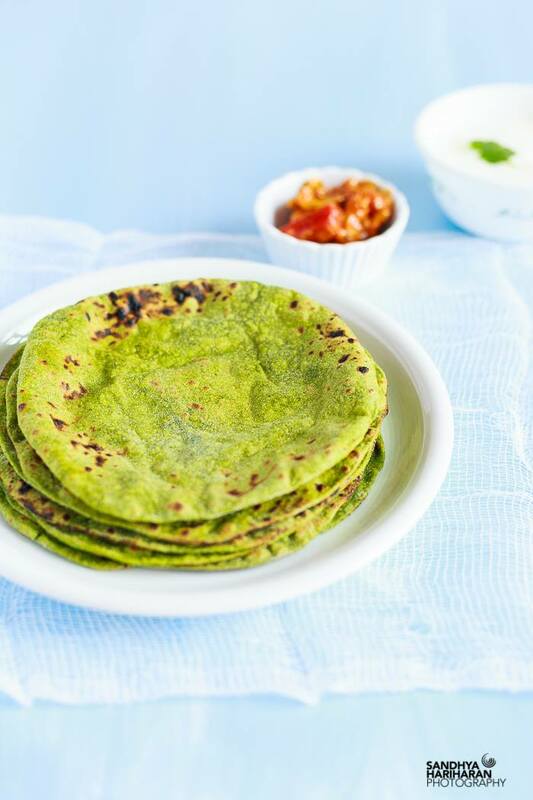 **In case you are not making it for kids, you can include green chillies to grind along with the spinach leaves. 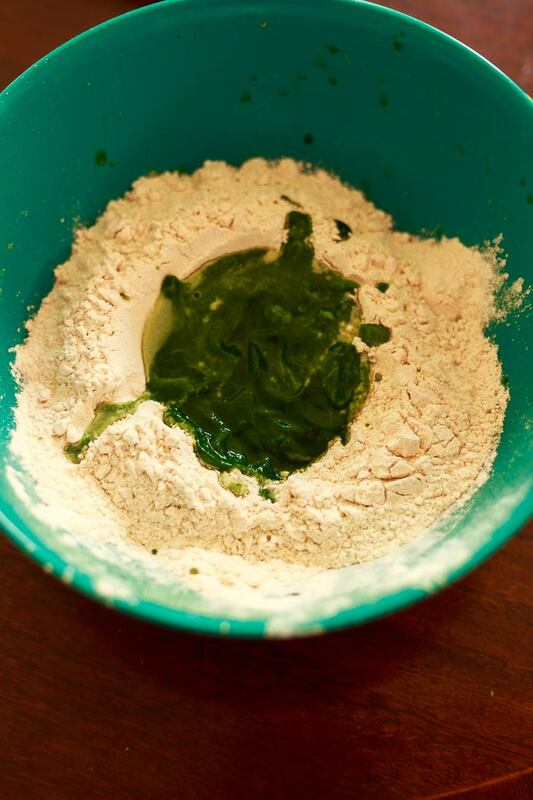 In a large mixing bowl, combine the spinach puree, wheat flour, salt, cumin powder and mango powder and start kneading. 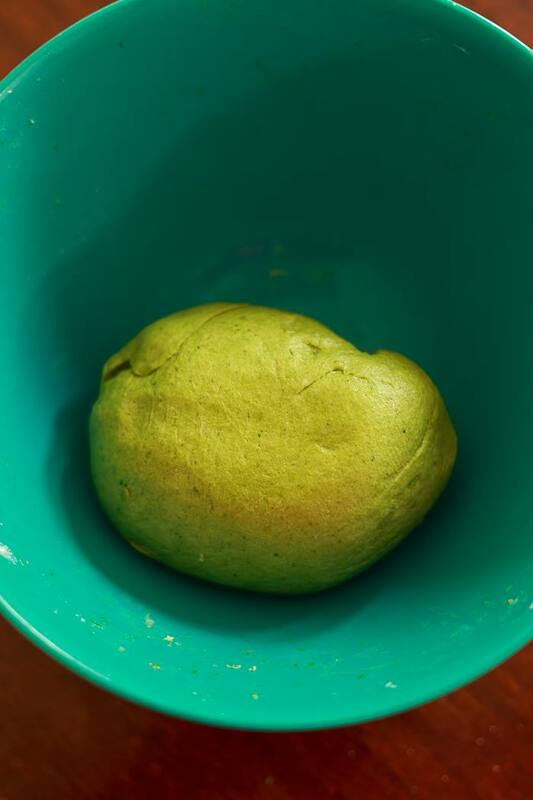 Add a little more water as you knead until you achieve soft pliable dough. 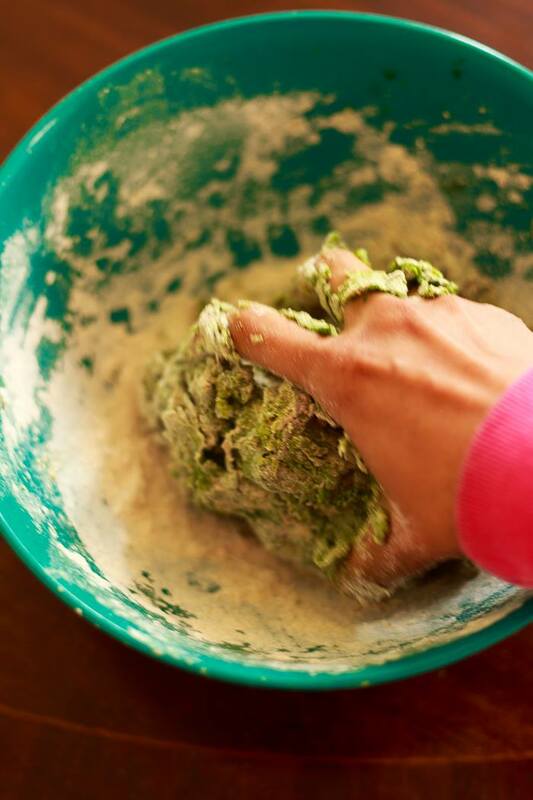 Splash the oil onto your hands and the remaining on the dough and knead until we have a clean bowl. Set the dough aside for 20 Minutes or so. Divide the dough into 20 equal portions. 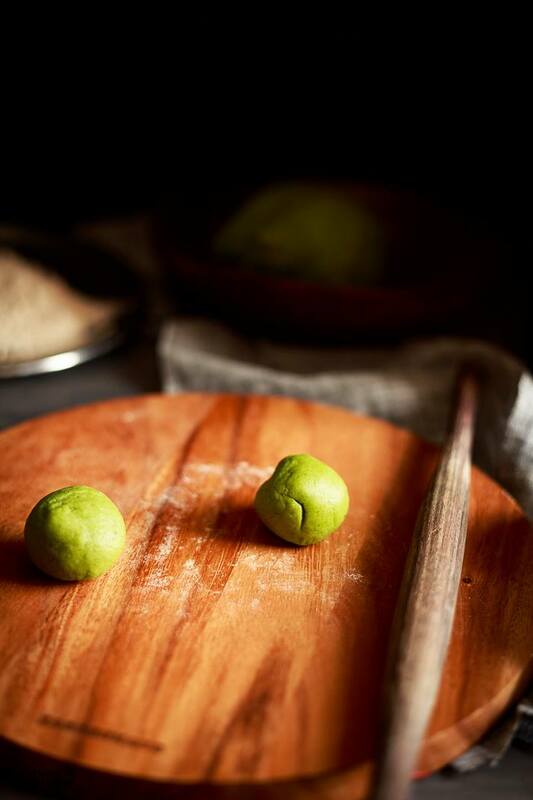 Pick one portion of dough at a time, dust some flour and spread them with the roller into thin phulkas. 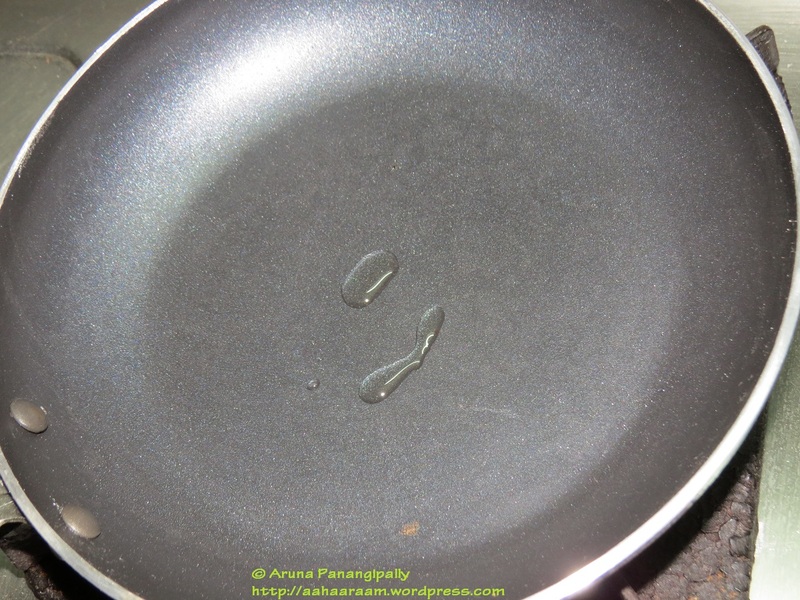 Heat a non-stick pan / tava and cook each phulka on the pan slightly for a few minutes until you start to see some bubbles. Flip the phulka and cook for another a minute or so . Now put the phulka on the flame carefully , watch them begin to puff up slowly. 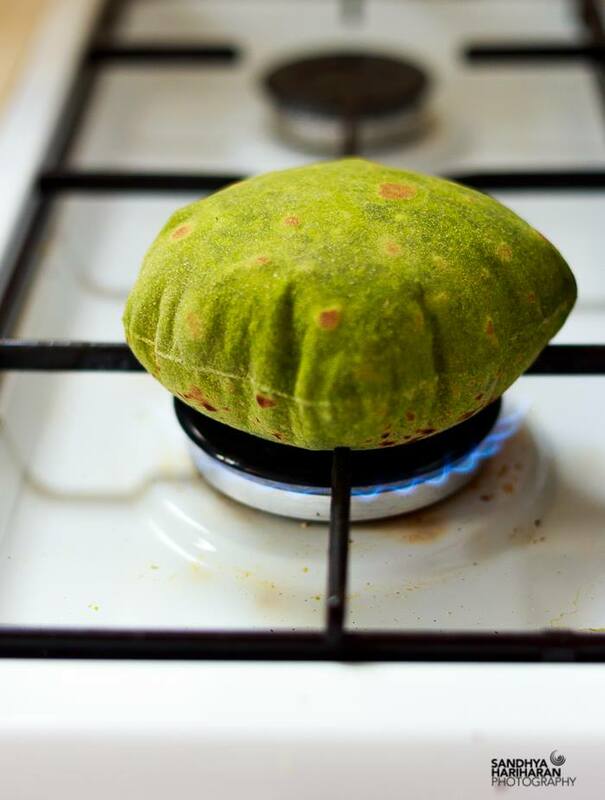 Flip it and allow it puff up on the other side as well. 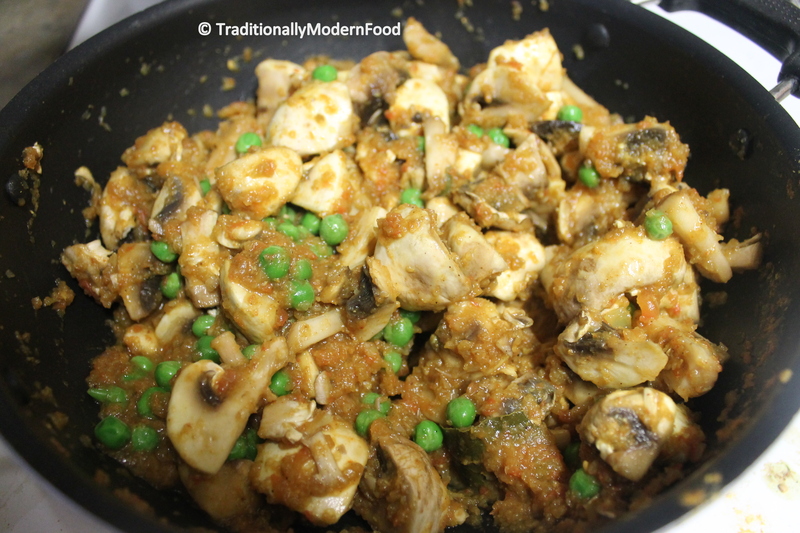 Remove from the flame and apply some ghee, if you like. 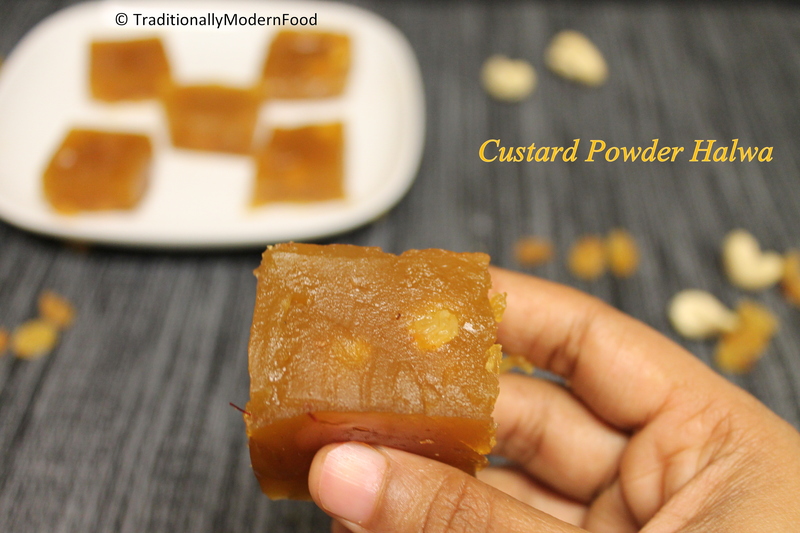 Pile them into a casserole and serve them along with a paneer curry or just some yogurt and pickle. ** Incase you do not want to flame bake it, you may cook for a few more minutes on the pan. Put a gentle pressure using a flat spatula on each side and then set them aside in a casserole to keep it warm. When you are serving the kids, you may let them roll and enjoy it as it is or dunk it in some yogurt. 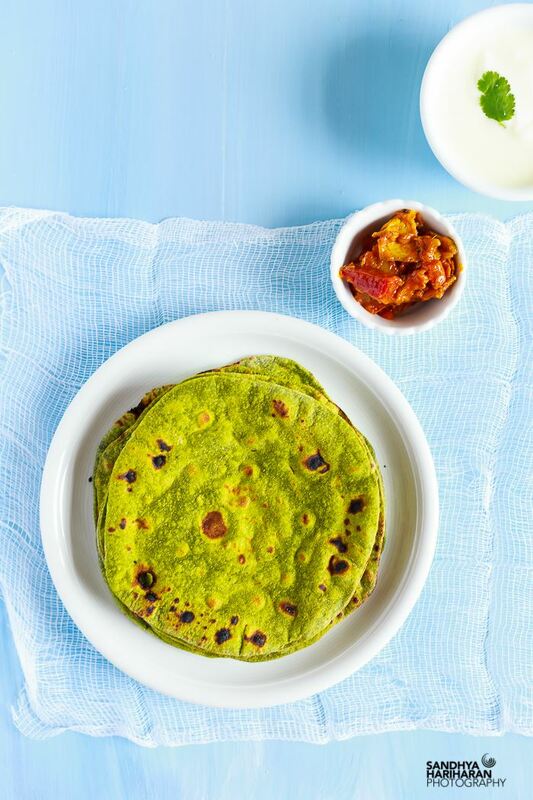 If you like your phulkas with a ting of heat, include the green chillies while grinding the spinach leaves. Do avoid if you are cooking for little ones. Mango powder is optional. I love the slight hint of tanginess. In case you do not want to flame bake it, you may cook for a few more minutes on the pan. 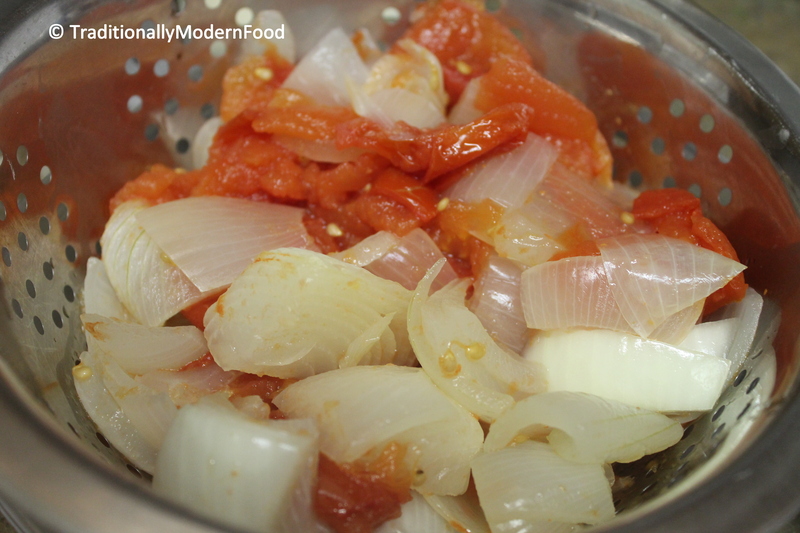 Put a gentle pressure using a flat spatula on each side and then set them aside in a casserole to keep it warm. Today we have a guest in Traditionally Modern Food, Aruna Panangipally from Aharam. 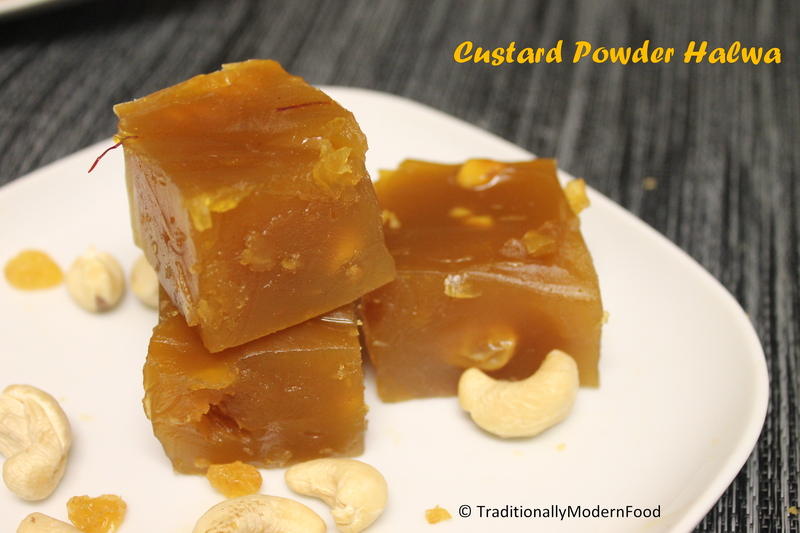 Aruna is not new to TMF, remember Custard Powder Halwa that’s for her lovely blog. First time I am having a guest in my space and I am so happy its Aruna. Aruna has a lot of knowledge about various Indian and international cusinines. 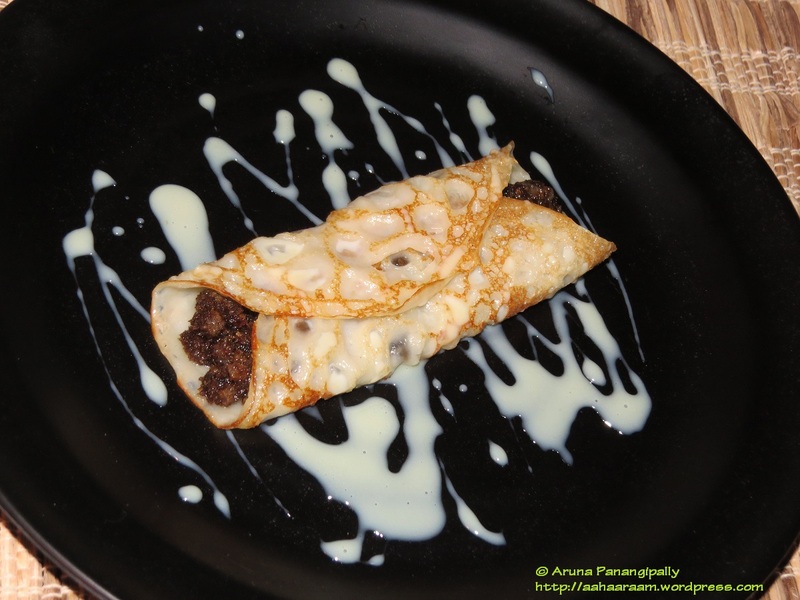 The moment I knew Aruna is going to give a guest post, I knew I would get a different dish for guest post but this Patishapta is a sweet surprise for me. Aruna mailed me with a list of few recipes namely, two Maharstarian dishes, one Bengali dish, two Andhra dishes and one Sindhi dish and asked me to choose one. Out of 6 recipes she mentioned, I had tried and tasted only 2 recipes:-) Selfish me wanted all the recipes but I told Aruna I love sweet any recipes is ok for me. I am truly honoured and excited to do this guest post for Vidya. 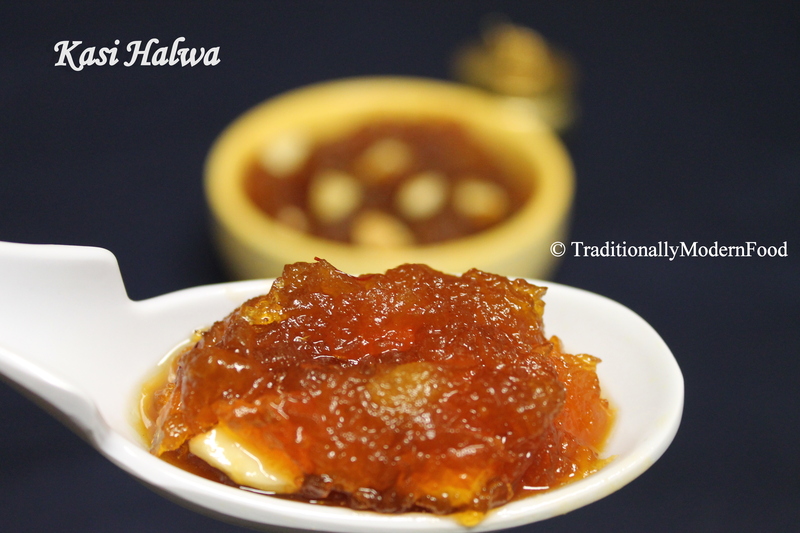 She made this fabulous Custard Powder Halwa as a guest post for me and this is my chance to reciprocate her generosity. When I was talking to Vidya about what she would like, she mentioned that she loves sweets and left the choice up to me. I needed a sweet that befitted the sweet person that Vidya is and so I thought of Patishapta. 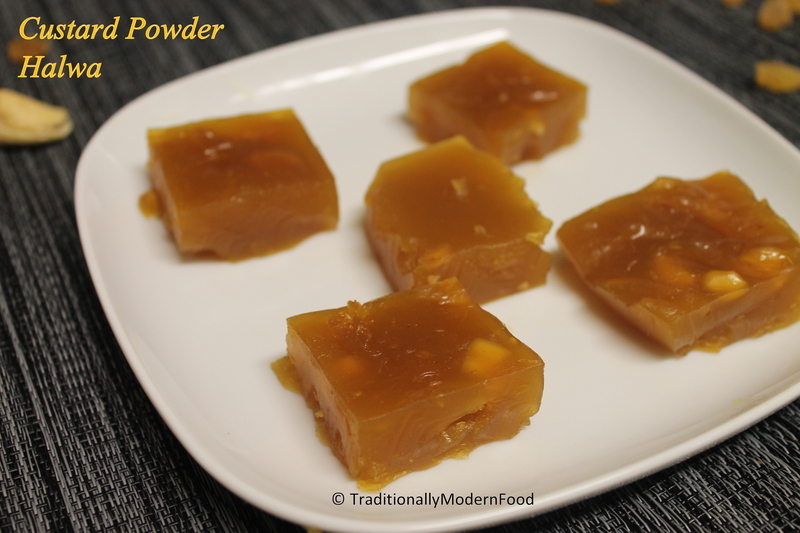 I added a bit more sweet to it by using a drizzle of sweetened condensed milk at the end. Here is hoping you like it! 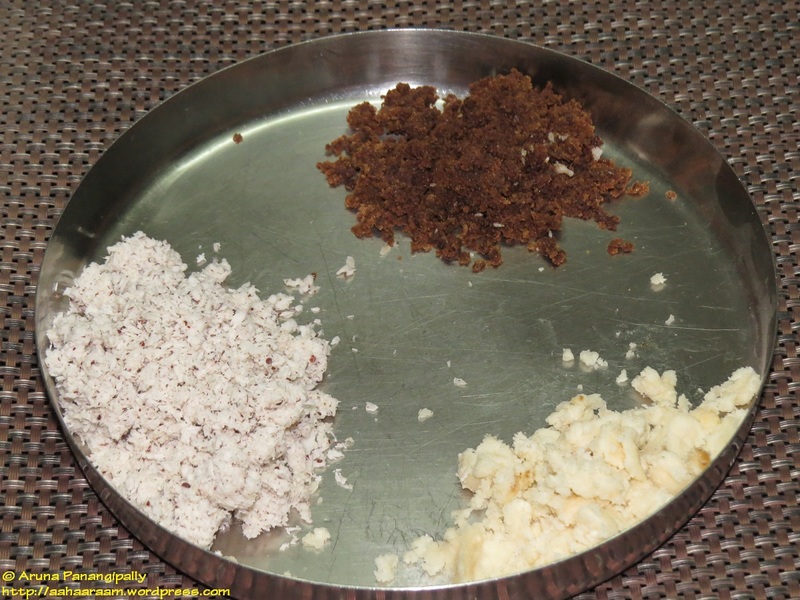 Mix the grated coconut, jaggery, and mava together. Place them in a heavy-bottomed pan or Kadhai. 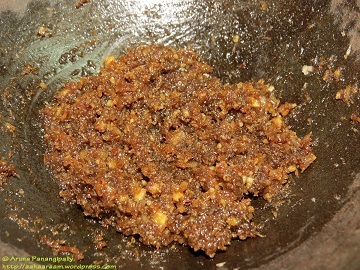 On low to medium heat, cook the ingredients till the jaggery melts and the mix becomes sticky. Dissolve the sugar in 2 cups of milk. 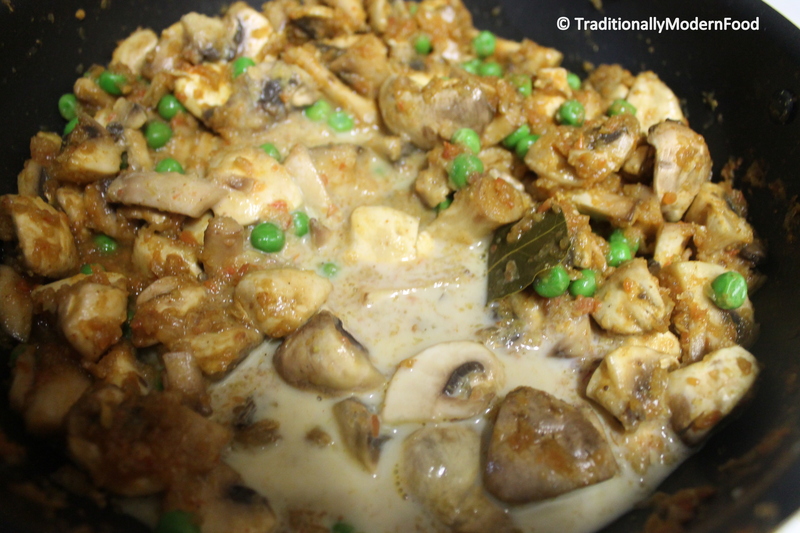 Mix together the maida, rava, and rice flour. 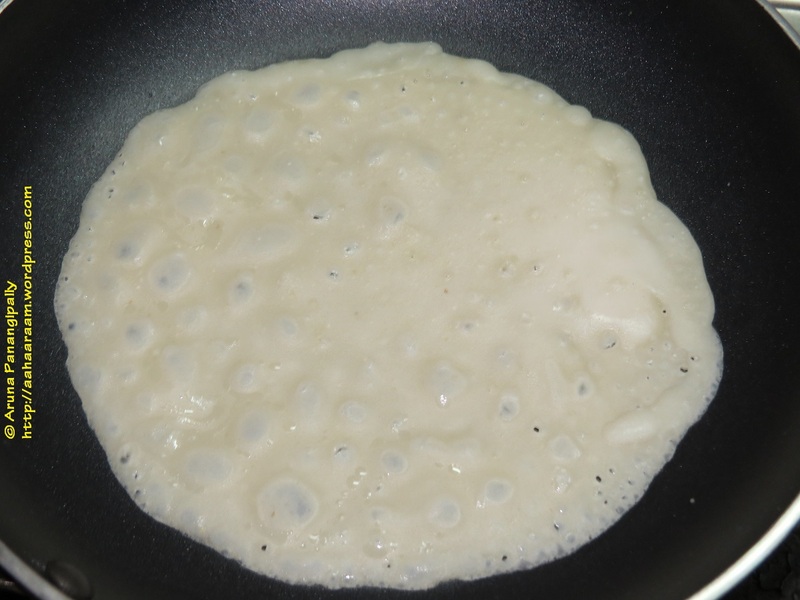 Add the sweetened milk and mix well to form a smooth, lump-free batter. Now add the rest of the milk slowly to create a batter of pourable consistency. Over medium flame, heat a tava or a pan. Spread a few drops of oil. 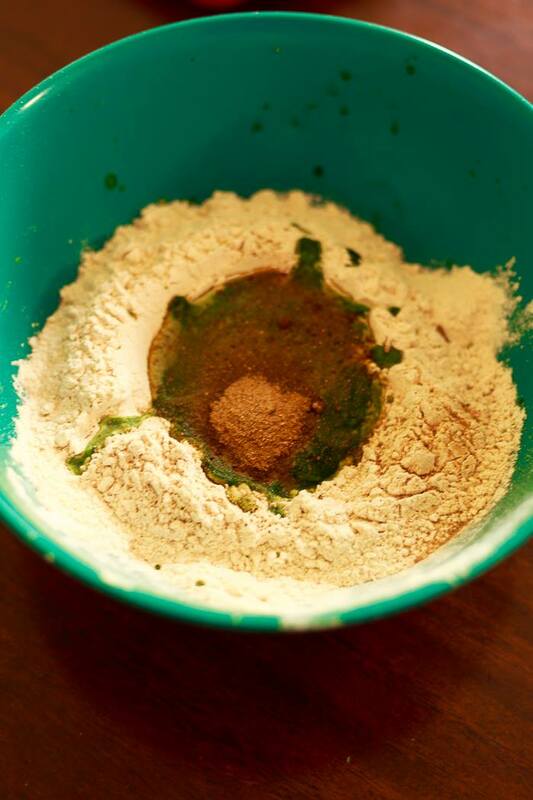 Pour about ½ cup of batter and let it spread by itself into a circle. When the edges start to brown, turn the heat to low. 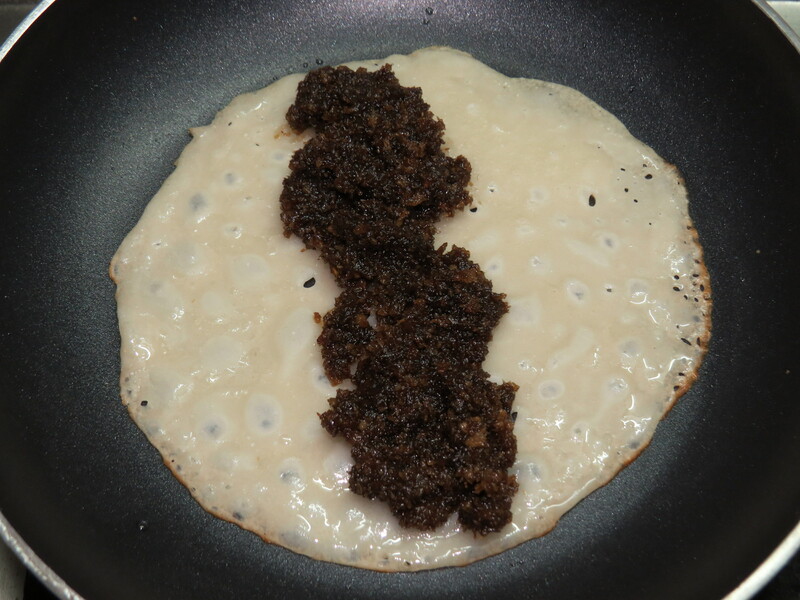 Place about 1.5 tbsps of the filling in the centre of the pancake in the shape of a thin long tube. Let it Patishapta cook for a minute or so. Repeat steps 2 to 7 to make other Patishaptas. 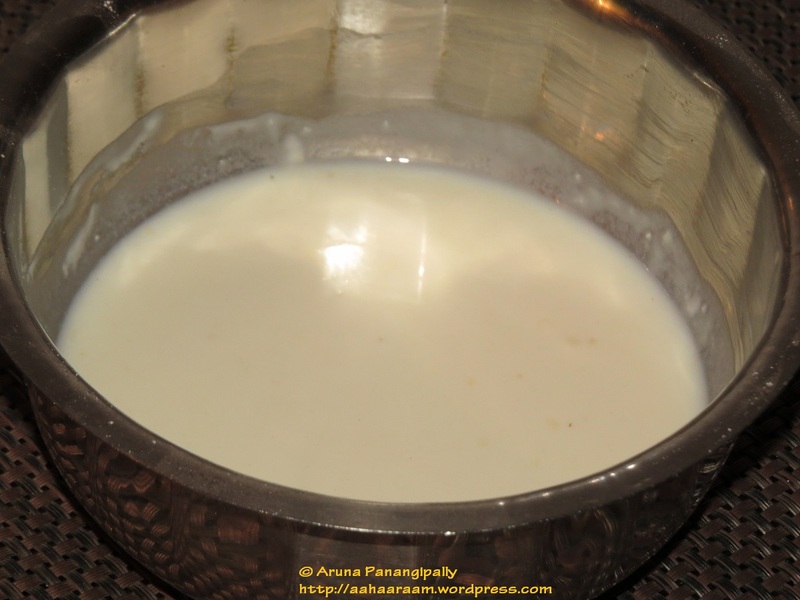 Just before serving the Patishapta, mix the sweetened condensed milk and regular milk together. Over low flame, heat the mix till warm. 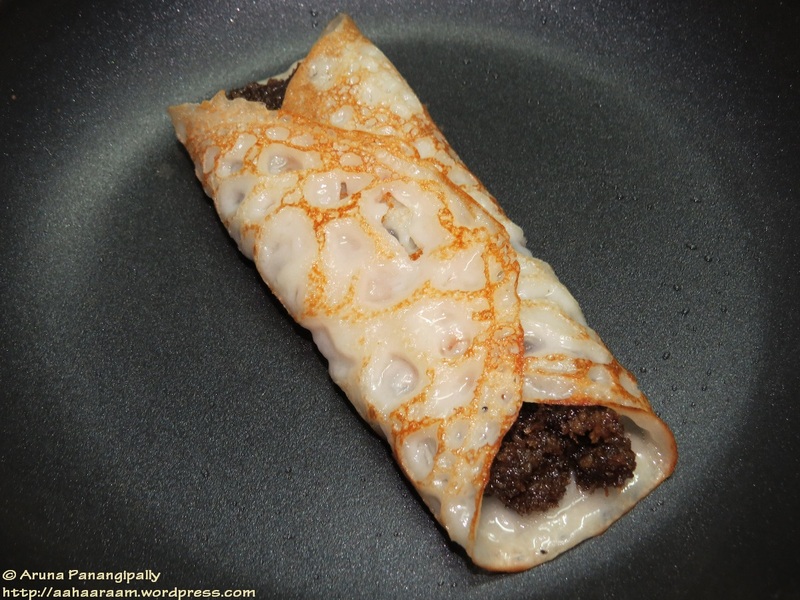 In a plate, place one Patishapta. 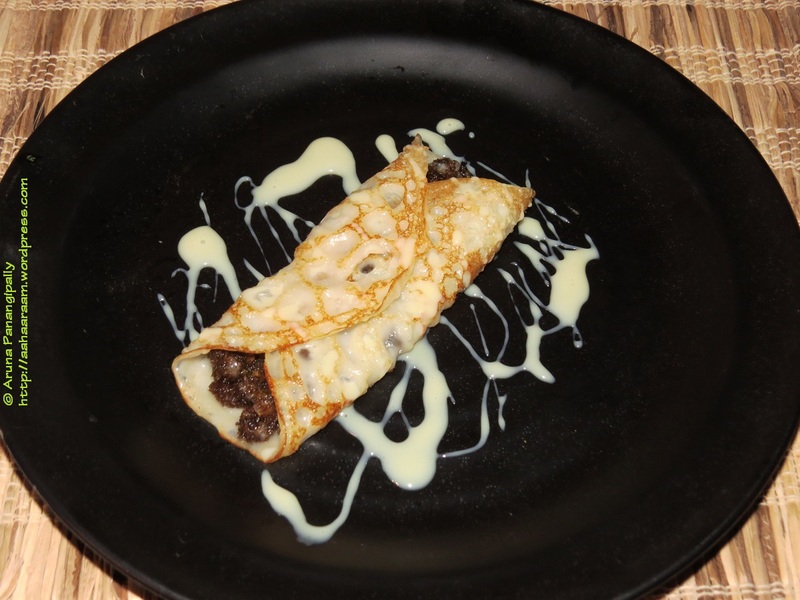 Drizzle 1 tablespoon of warmed condensed milk over the Patishapta. 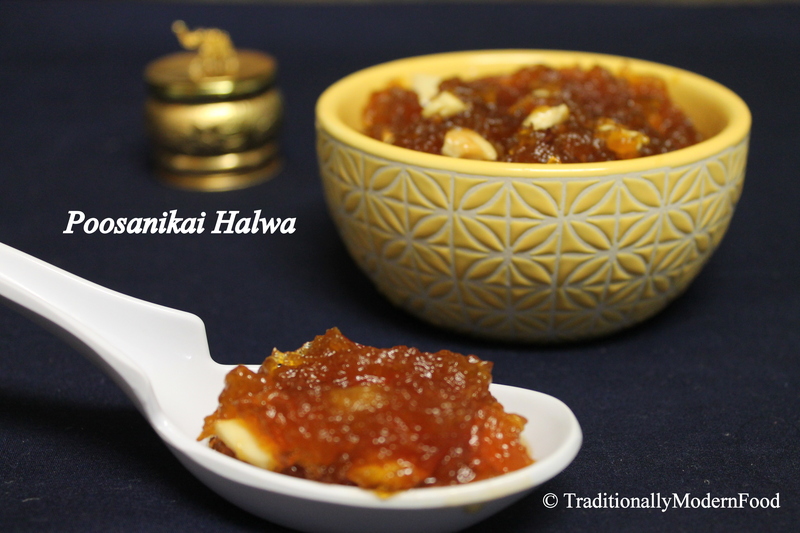 Take a bite, close your eyes and savour the taste! 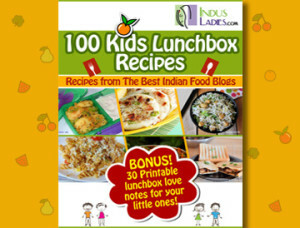 Thinking what to cook for lunch box and Preparing lunch for kids is a challenging task. As a kid i was in demanding side 🙂 now in few years i will be on other side. 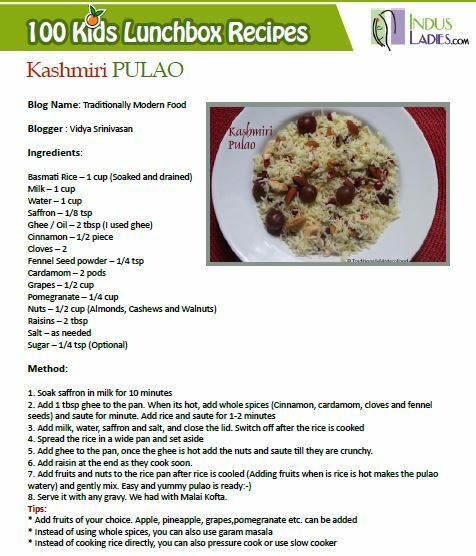 I am extremely glad to be the part of it and Thank you IndusLadies for adding my “Kashmiri Pulao” recipe. Writing a Guest post is always exciting. When Beula from EaterSpot asked me to do a Guest post, I accepted happily. The joy was doubled when she told me it was for celebrating the Indian Independence day! “I began blogging in March 2010 purely because of boredom. I moved from the US to New Zealand, had a full time job, was newly married but wanted to do more stuff … thus my food blogging journey began. Over on my blog EATERSPOT, I share about recipes that have been part of my family and new recipes as well based on my current cravings or menu planning. Thanks Beula, for hosting me, and joining us in celebrating the Indian Independence Day. JAI HIND.